A Day Late and A Dollar Short: Kirkland's - BOGO 50% and New $10 Coupon! Kirkland's - BOGO 50% and New $10 Coupon! For four (4) days only, you can buy one, get one 50% selected merchandise at Kirkland's. 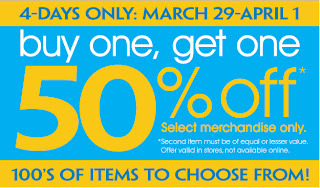 The dates for this sale are 3/29 through 4/1, and there will be 100s of items to choose from to make your pair. Also, visit the Kirkland's website before you go to print out a coupon good for $10 off a $50 purchase.